After two glorious months in India, my journey was coming to an end. I was about to venture back out again into the unknown. 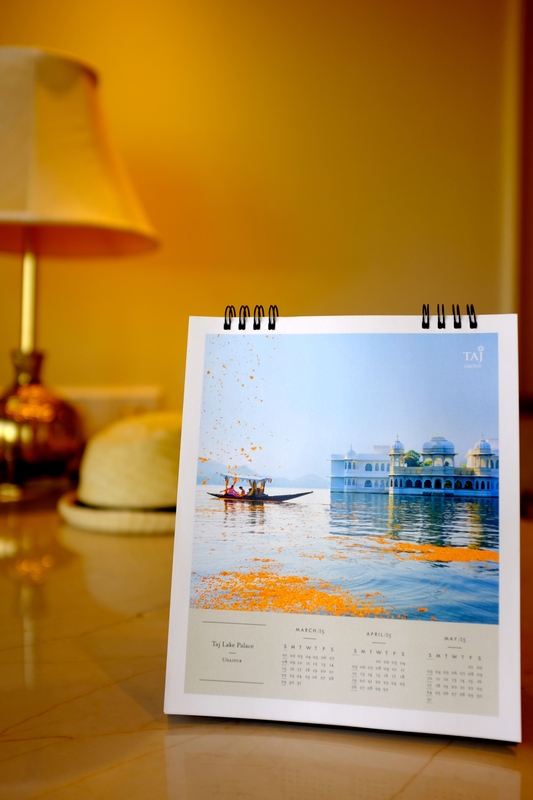 India had almost become a security blanket for me and I had become use to all of its quirks, delights and annoyances, it was starting to feel like home. I can understand how people are drawn to the place and never want to leave. The North was on my agenda at the start of the trip, however I never made it that far, there was too much to see and experience in the South. Feeling accomplished for travelling on my own, knowing that at times I had to sacrifice experiences because it was “just me” I felt that I deserved for my last night in India some pampering and a bit of luxury. And since I hadn’t travelled up North to visit the real Taj Mahal in Agra I thought what could be the next best thing? 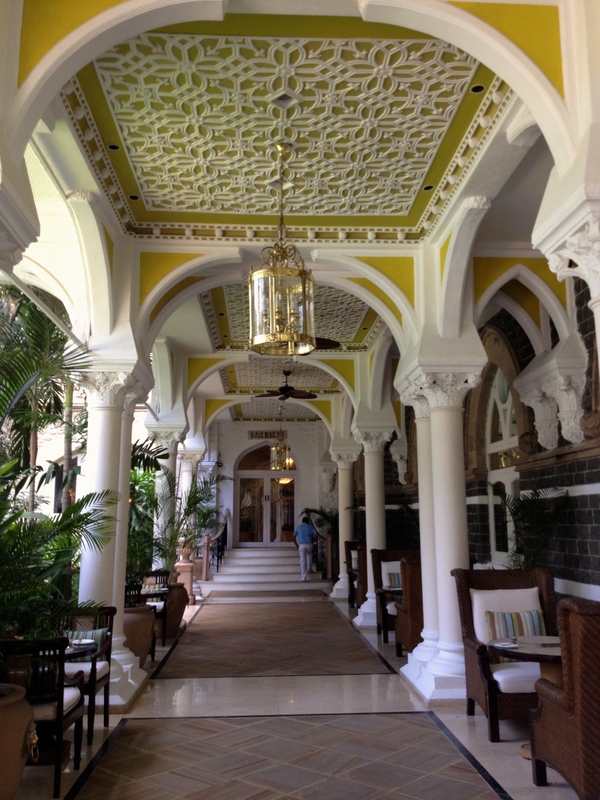 Staying at the Taj Mahal Palace of course! So I booked a room online and was very happy with the welcome emails sitting in my inbox ensuring I was about to have a wonderful stay. Being asked if I had a pillow preference was heaven after some of the terrible nights sleep I had experienced over the past two months. But my first impressions quickly faded from this is going to be heaven to hmm this could be an interesting stay when I then had another seven emails back and forth arranging other details for my stay, where depending on the time of day I replied I would have a different person responding to my request not taking into consideration the previous correspondence. But thankfully this was the only glitch in the experience. On arrival you have to go through what feels like airport security due to the terrible terrorist attack and bombings on the hotel in 2008. 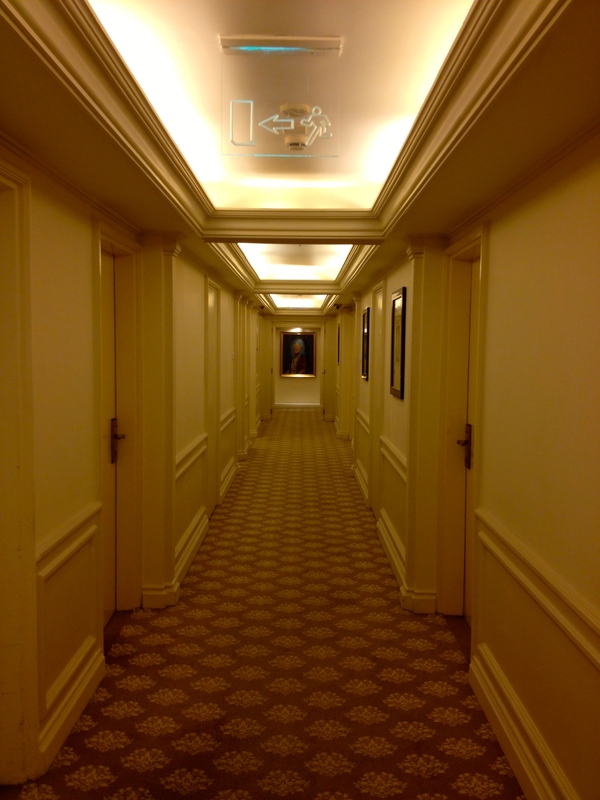 The hotel has done a superb job with the restoration. Sure there are areas of the hotel that feel tired and need updating, but to be able to keep such a magnificent building in tack is miraculous considering the horrific event. After a smooth check in I admired the view from my seafront window, though it was unfortunate to have a protective mesh covering the window, perhaps an aftermath of the terrorist attack. 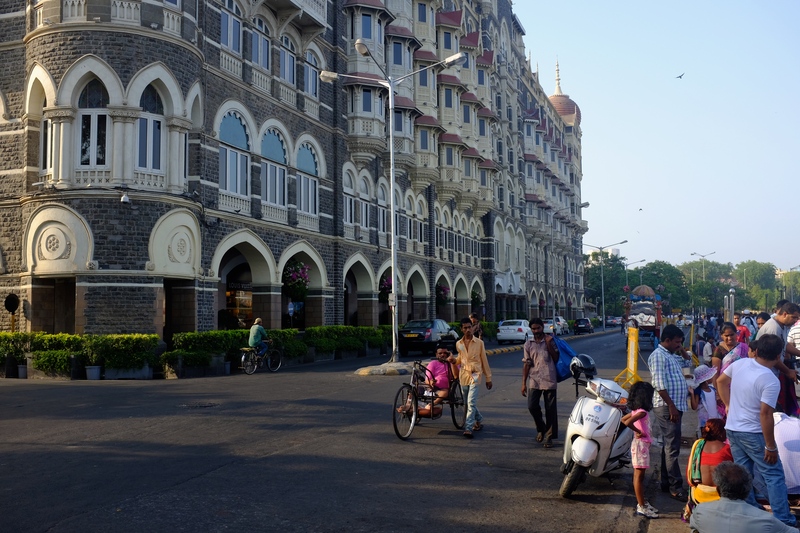 The hotel on the ground floor is lined with luxury stores such as Louis Vuitton and Dior, a sign of the tourist dollar perhaps or the Bollywood revenue prominent in the city. 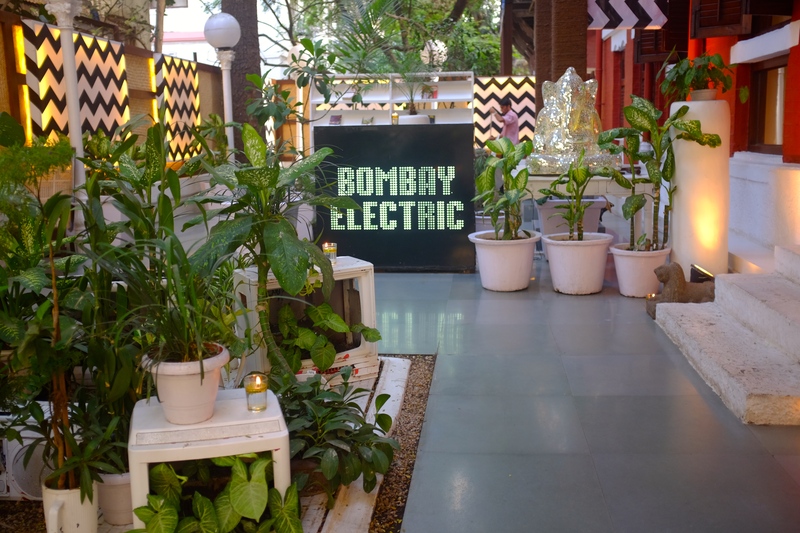 I opted to skip around the back of the hotel where I discovered Bombay Electric and managed to pick up a few great pieces of jewellery as a memento of my time in India. Feeling thirsty I headed back to the hotel which has ten established restaurants and bars and headed to the Sea Lounge for a glass of champagne and to experience its sea views. 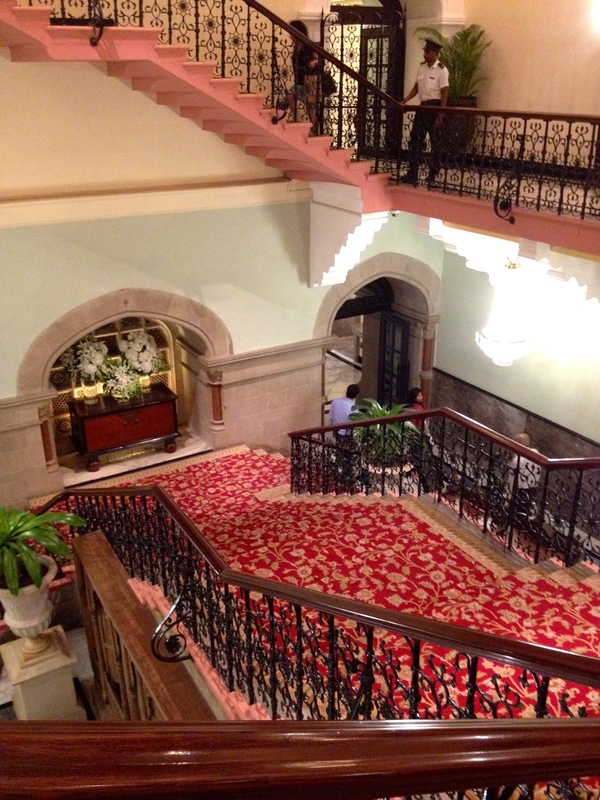 Not quite the view I was expecting, I guess its hard with no balcony, but the art deco furniture and colonial charm was lovely and I was welcomed by a gentleman playing on a grand piano which all added to the ambience. If I had my time again, I would book in for high tea as the room and setting was perfect for this. By this stage I was hungry and after heading up to Souk for dinner and to enjoy their rooftop views, being disappointed with this view also, I managed to get a reservation at Wasabi by Morimoto instead. 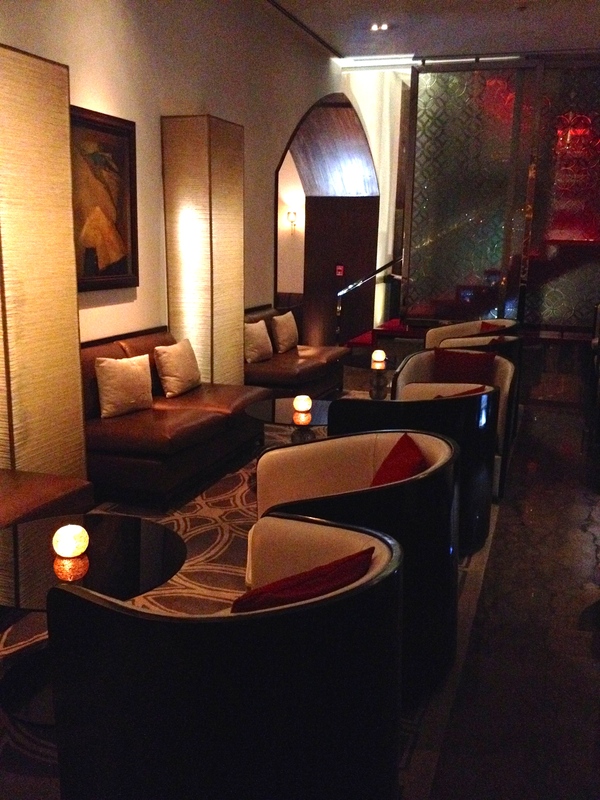 It was an amazing meal and you see why this restaurant was recognised as one of Asia’s Top 50 restaurants. It had a lot more atmosphere than Souk, potentially due to it’s more intimate size, but it was exactly what I was after. It was a refreshing change after eating Indian vegetarian meals for the past two months. Part of me was still however nervous eating meat in India as you hear of food poisoning occurring in hotel restaurants, but thankfully there were no issues here! 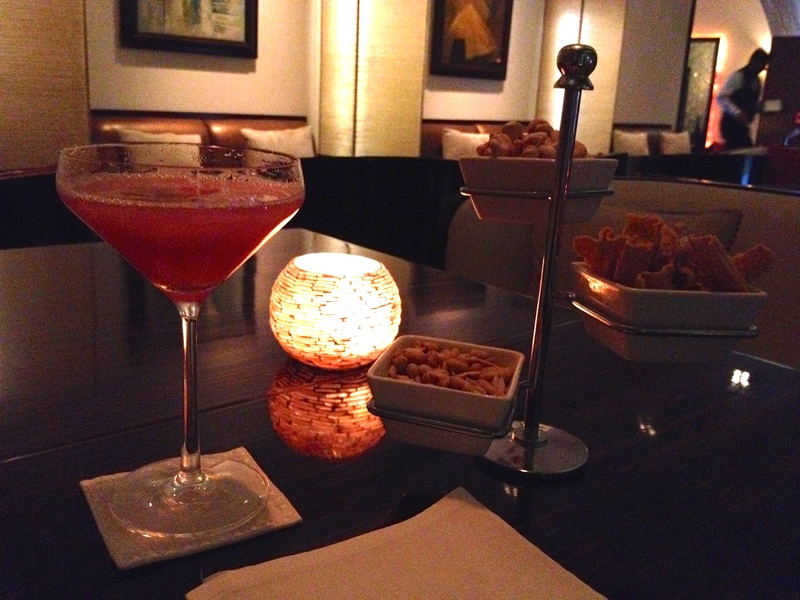 To close my evening I couldn’t leave Morimotos’ without walking through Harbour Bar. 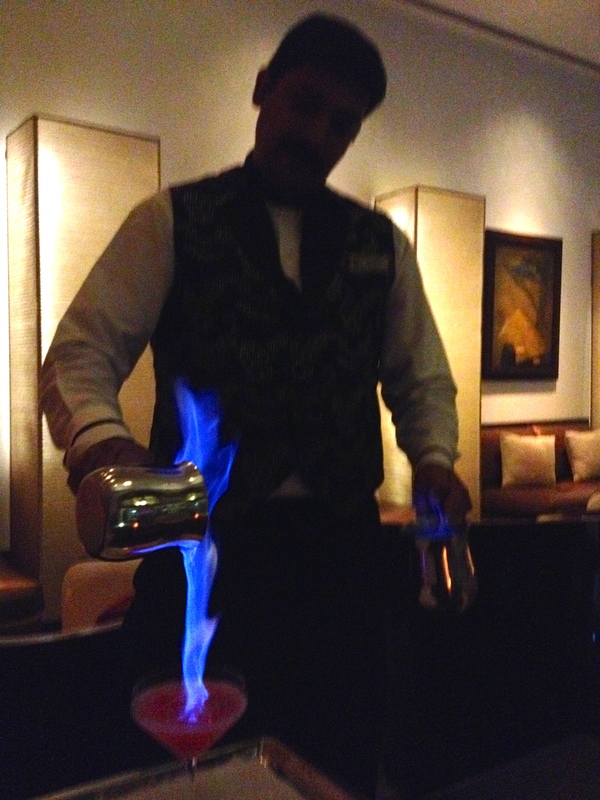 How could I resist a cheeky flaming cocktail on departure. I was tempted to stay for another but I had done enough damage for one evening. I woke up refreshed after a very comfortable nights sleep, yes the pillows were heaven and I enjoyed a nice breakfast outside on the terrace by the pool. One coffee down and I was starting to become accustomed again to my vices I had neglected for the past two months. My toes were in dire straits and with Dubai as my next destination there was no way I was going to have my feet on show in the current state they were in. 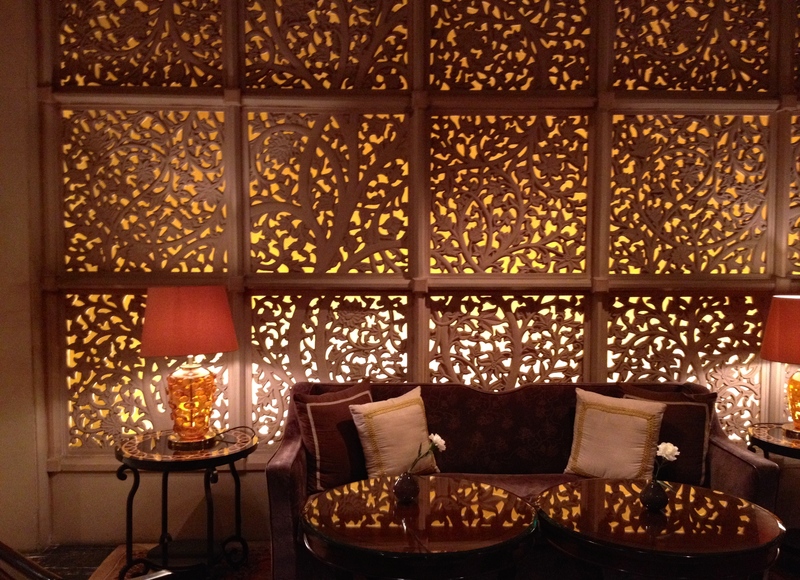 The spa at the hotel was excellent and it was such a nice change after the disastrous pedicure I had in Madurai. A lovely gentleman potentially in his early 60’s did my pedicure. His father had also worked at the Taj prior to him and his son was a hairdresser in Dublin. I think I possibly experienced the best polish I’ve ever had. My last appointment before I headed off to the airport was a Vedic Astrology session. I had never had one before and curiosity got the better of me. Astrology remains an important aspect of many Hindus lives and I was intrigued to see why. After a fascinating hour session and feeling more educated on this ancient Indian science based on planetary movement and the effects they have on people, it was time for me to check out and make my way to the airport. 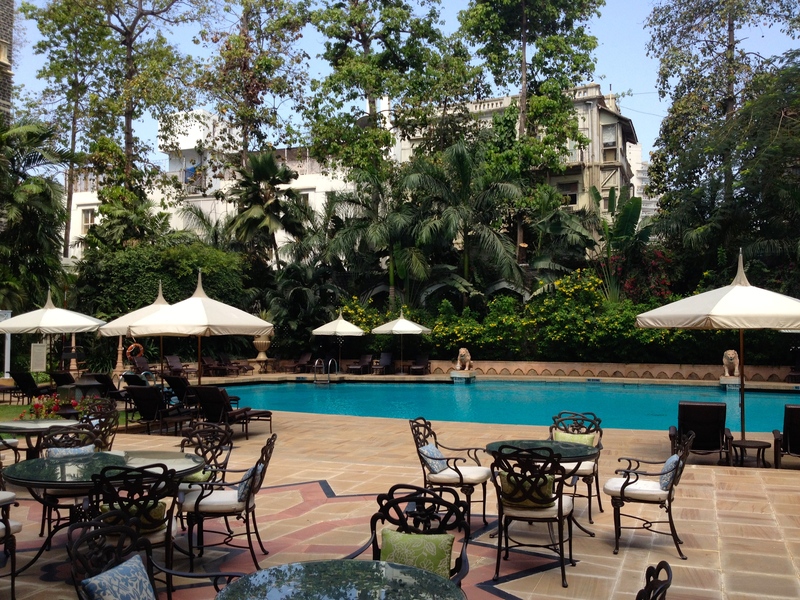 The past 24 hours spent at the Taj Mahal Palace had been a great way to end my time in India. Yes it was slightly extravagant and with the taxes added on top of everything, I could have purchased a luxury handbag, but I figure it’s not everyday you get to stay in such a grand setting. Plus it was a good way to ease me into the extreme wealth I was about to see in Dubai! As my taxi pulled away from the hotel, I had a sense of melancholy knowing I was about to leave this glorious city and country. I was excited to be continuing on with my travels and looking forward to catching up with friends and family, but India has left me with lasting impressions in my mind and an allure that is wanting to draw me back. With so much more to see and experience I hope that time eventuated again soon.